With these words Renato Guttuso, one of the most prominent Italian painters of the 1900s, described the essence of his art. Guttuso conveyed the times in his own distinctive style – a style linked to Cubism and Picasso (whom he met and befriended in the 1950s), as well as Fauvism, Expressionism and 19th-century French art. His oeuvre was strongly influenced by his native land, Sicily. 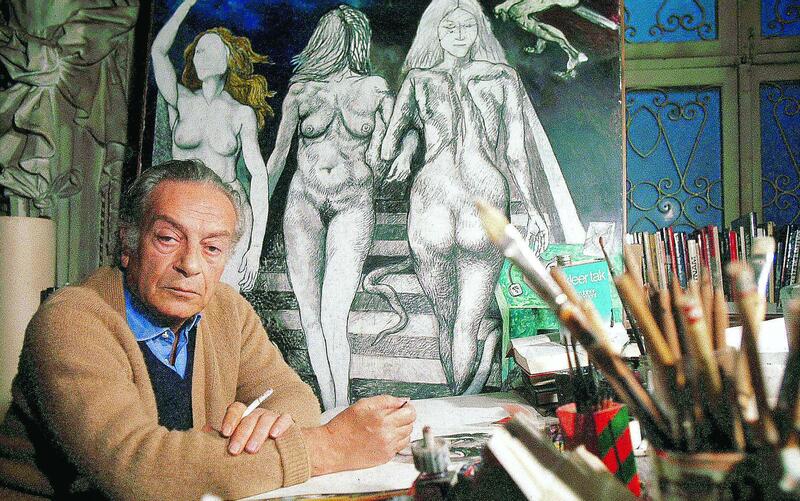 Guttuso started signing and dating his canvases at the age of 13, and was exhibiting at 17. He trained in the workshop of Emilio Murdolo, a Sicilian cart painter. His works were also inspired by his childhood memories, like those of the grotesque figures and violent scenes of the sculptures lining the garden walls of the patrician Villa Palagonia, near Bagheria, where he was born into a modest but artistically-sensitive family. While Guttuso was mistakenly labelled a social realist, he would eventually become the best-known exponent of neorealism. Among his friends were fellow-Sicilian Elio Vittorini and Alberto Moravia, both famous neo-realist writers. Renato Guttuso’s style developed between the cities of Milan and Rome. He did his military service in the 1930s in Milan, where he also met intellectuals and artists, like Renato Birolli and Lucio Fontana. In 1937, he moved to Rome, where his art studio became one of the most frequented intellectual centres of the Italian capital. The violence of those years irreversibly affected Guttuso’s life and art. Episodes, such as the execution of playwright and poet Federico García Lorca, or the bombing of the Basque town of Guernica during the Spanish Civil War, left their mark on Guttuso, who manifestly expressed his anger via large-scale canvases based on social and anti-fascist themes. “A painter has to recount and glorify the events of his time,” the Sicilian artist once wrote. And that’s what he did. From the series of 1940s drawings called ‘Gott mit Uns’ (God with Us) - a motto German soldiers had inscribed on their belt buckles - to the works depicting an occupied Rome and Nazi atrocities - for example, ‘Shooting in the Countryside’ and ‘Flight from Etna’ - Guttuso created his own popular mythology, characterised by vivid images and intense colours. In 1940, precisely the day after Italy entered the war, the passionate painter joined the Communist Party and would remain active at a political level for his entire life. In the 1970s, he was elected Senator and held office for two terms. During World War II, the artist’s studio became a veritable anti-fascist meeting place. Between 1940 and 1941, Guttuso produced one of his most famous canvases: ‘The Crucifixion’, hailed by critics as a masterpiece of the 20th century. The painting sparked controversy and was strongly criticised by the Catholic Church for its portrayal of a naked Mary Magdalene. At the same time, however, the painting was a masterful summation of Cubism and Italian Renaissance art. While the subject may have appeared to be in stark contrast with the painter’s values and ideals, in actual fact, it was a poignant rendition of the pain and suffering brought by war. The Crucifixion won the prestigious Premio Bergamo and clearly established Guttuso’s position in the formal debate between 20th-century realism and abstraction. The Sicilian artist adhered to the creed of representing objects and their essence. In his paintings, objects often took on metaphorical or allegorical significance. At the end of the war, Renato Guttuso co-founded the Fronte nuovo delle arti (New Arts Front) with Renato Birolli, Emilio Vedova, Giuseppe Santomaso, Bruno Cassinari. The purpose of this movement was for Guttuso and his fellow artists to challenge the “aesthetic principles” of the 1900s in Italy - by that time deemed outdated - and counter the metaphysical art of Giorgio de Chirico and Carlo Carrà. The group exhibited at the 1948 Biennale, one of the most historically significant editions, but the fraternity was short-lived and the New Arts Front disbanded due to ongoing internal debates about figurative and non-figurative art. While Guttuso was also designing stage sets, he continued his narrative painting across the second half of the century. In ‘The Beach’, we can see a huddle of bodies on Ostia’s seashore. Among them, the figure of Picasso, simulating the stance of a bullfighter. The early 1950s were dedicated to a cycle of paintings whose subjects included the Sicilian sulphur mines. Another political work is a large canvas depicting the funeral of Palmiro Togliatti, leader of the Italian Communist Party. Guttuso’s artistic period, however, culminated in the neorealist masterpiece ‘La Vucciaria’, which magnificently represents Palermo’s street market. From the late 1960s onwards, alongside social themes, a new subject appeared to be increasingly present in Guttuso’s work: the female figure. This coincided with his encounter with Countess Marta Marzotto, who became his muse and lover. Both the painter and the countess were respectively married: Guttuso to Mimise Dotti (since the late 1940s), and Marta (nee Vacondio) to Count Umberto Marzotto, co-owner in a family textile business. Both parties lived a tormented but passionate affair for 20 years, but it was a union that left a trail of consequences, not least of which were unresolved legal issues.